Portland is everything a coastal city should be – vibrant yet relaxed, postcard-pretty but endearingly eccentric. Stroll around the cobblestone streets of the Old Port District and you’ll soon realise why it regularly makes those “coolest small cities in America” lists. Portland is bursting at the seams with excellent restaurants, local coffee roasters, craft breweries, quirky shops, and art galleries. The uphill walk from the centre of Portland its Eastern Promenade is worth it for the expansive views of the bay. A pristine green area slopes down to a waterfront trail, which is ideal for runners and walkers. Given how much eating you’ll probably do in Portland, the waterfront trail could be the perfect break between food rounds. Besides Portland’s good looks, arty ways, and almost overwhelmingly exciting food scene, it’s also one of the friendliest cities I’ve ever visited. Drifting in and out of shops and cafes, I found myself having surprisingly in-depth chats with strangers. There’s a wonderful warmth in Portland, that makes spending time here a pleasure. So don’t make it a flying visit – try to spend a couple of days in the city and soak it all in. Although Portland is the biggest city in Maine, it’s refreshingly walkable. The Old Port District has a seaside town feel and wandering around is part of the fun. If you need a coffee break, try Arabica Coffee on either Free Street or Commercial Street. Arabica roasts its own beans, so the coffee is fresh and flavourful. They also have a bakery in the Commercial Street location and I can vouch for the deliciousness of their gluten-free apple spice muffins. Portland sits on a peninsula in Casco Bay, and the sea is an integral part of the city. So expect lots of nautical themed products, squawking gulls on the waterfront, and more seafood restaurants than you’ll know what to do with. But if you’re looking for a meat and fish-free lunch, head to Local Sprouts Café. Although it’s not entirely veggie, Local Sprouts has plenty of options for vegetarians and a decent selection of vegan options. Their focus is on using locally-sourced and organic ingredients while supporting as many Maine growers as possible. Over 4,600 islands dot the waters off the coast of Maine. The majority of the state’s pine-topped islands are remote and uninhabited, while some are privately owned. Other islands are home to small communities and picturesque towns, while some are havens of nature and peace. Casco Bay is a great place to start, as its islands are some of the most accessible. Year-round ferries run to six of the Casco Bay Islands – Peaks Island, Little Diamond, Great Diamond Island, Long Island, Chebeague Island, and Cliff Island. During the summer, there’s also a ferry service to the tranquil Bailey Island. 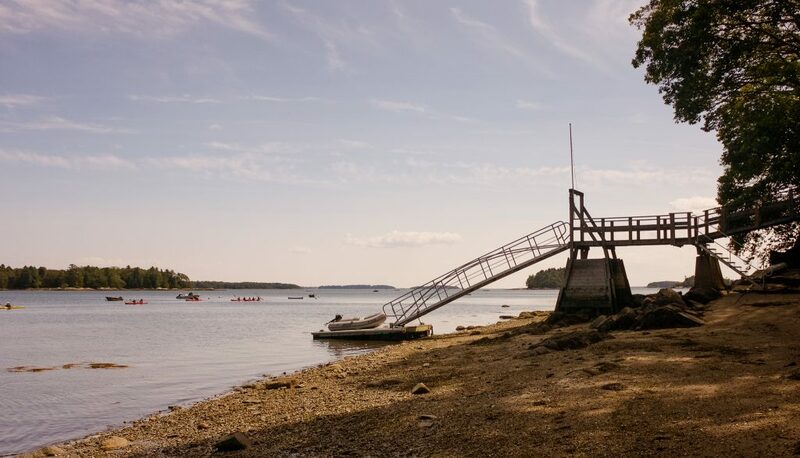 Quiet walking trails, beaches, and soaring wildlife make visiting Bailey Island one of the most relaxing things to do in Maine. 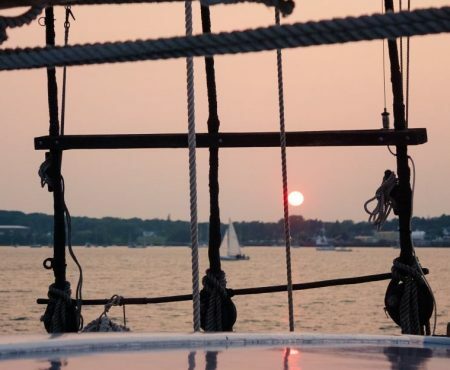 If you want to explore the midcoast and the southern Maine coast, the view doesn’t get much better than from the deck of a windjammer. These traditional tall ships are an important part of Maine’s maritime history and they look truly majestic when they sail. I sailed the Maine coastline aboard the Victory Chimes and it allowed me to experience the landscape and local wildlife in the most wonderful way. The Victory Chimes is part of the Maine Windjammer Association’s eight-ship fleet. As North America’s biggest fleet of historic schooners, the Maine Windjammer Association is a business that’s clearly infused with passion. The captains and crew of each ship work together, determined to protect and preserve these historic ships and a traditional way of sailing. Sailing season runs from the beginning of June to the end of September and some of the sailing trips are themed. I was aboard for the Victory Chimes Wellness Sail, which involved sunrise yoga sessions on deck, daily holistic treatments, and evening meditation sessions. We ate lunch while gliding past lighthouses and sipped wine in the evenings to a backdrop of glowing sunsets. There are 65 historic lighthouses along the coast of Maine. For years, these lighthouses have helped sailors to safely navigate Maine’s rocky coast. But they also happen to look pretty, so if you’re interested in photography, lighthouse-spotting is one the best things to do on the coast of Maine. Portland is home to the oldest lighthouse in the state of Maine. The Portland Head Light, which was commissioned in 1791, has become one of the most popular things to see in Southern Maine. But the most photographed lighthouse in Maine is Pemaquid Point. Built in 1835, Pemaquid Point Lighthouse has been beautifully preserved, alongside the lightkeeper’s home. There’s also a museum and lots of space for a seaside picnic in the surrounding coastal park. If you want to combine your lighthouse visit with a beach trip, Pemaquid Beach Park is just nearby. Most of Maine’s remaining lighthouses aren’t accessible by land and boat trips are the only way to see them. But Rockland Breakwater Lighthouse is unusual because it’s perched at the end of a mile-long walkway that extends into Rockland Harbour. The walkway is really a breakwater, made up of granite blocks, but visitors are free to traipse across it to reach the lighthouse. Be prepared for the occasional boat sailing past the breakwater – a nice reminder of the fact that you’re walking out to sea. The Farnsworth Art Museum is one of the most highly-regarded small regional museums in the U.S. Located in the pretty coastal town of Rockland, the Farnsworth’s collection spans 200 years of American art. There’s a particular focus on the work of Maine artists, so a visit to the Farnsworth is also a chance to see the landscape of Maine from a different perspective. The additional Wyeth Center, dedicated to the works of the Wyeth family, is housed in a converted church. Regarded as one of the most important families in American art, the Wyeth family depicted their home state of Maine throughout their works. Exhibitions at the Farnsworth change from year to year and a visit here is a lovely way to spend an afternoon. As the only national park in the state, Acadia is possibly the most iconic of Maine’s attractions. The park covers an overwhelming 47,000 acres of land on Mount Desert Island, Isle au Haut, and the Schoodic Peninsula. So you’ll find every variety of Maine’s landscape within its borders – from pine forests and mountains to rocky coastline and marshland. 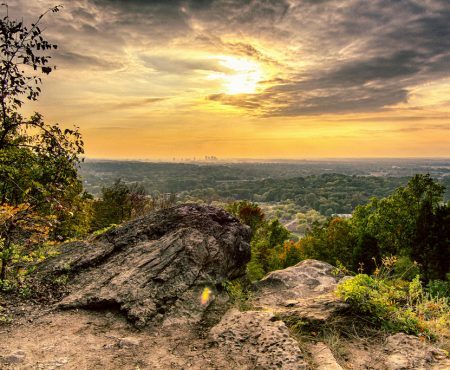 Whether you’re a serious hiker or more of a leisurely explorer, you’ll find plenty to keep you in busy. Over 125 miles of trails weave throughout Acadia, circling sparkling lakes and winding through dense forests. A large section of the national park includes is Mount Desert Island, an area of stunning natural beauty and home to the summer town of Bar Harbour. If you’re planning to base yourself in the national park for a few days, Bar Harbour is the best place to stay. 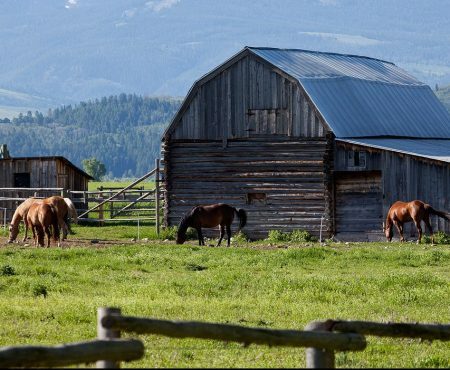 Accommodation options include hotels, B&Bs, campgrounds. It’s worth noting that crowds descend on the park during the summer and locals recommend late September as the best time to visit. If you visit Maine during the summer months, make sure to fit in a wild blueberry feast. They’re tiny blueberries, probably much smaller than what you’re used to, but their sweetness is surprisingly powerful. These wild blueberries, otherwise known as “lowbush” blueberries, ripen once a year in Maine and Novia Scotia around harvest season. Even if you don’t get the chance to take part in the harvest picking festivities, you can buy cartons of wild blueberries from local markets and roadside stands in Maine. There are also endless variations of blueberry infused desserts on the menus of restaurants throughout the state. But really, nothing beats eating them in handfuls straight out of the carton. And the option to stop mid-road trip for a bagful of fresh fruits and veggies was one of my favourite things about the wonderful state of Maine. Still looking for things to do on the coast of Maine? June to August is peak tourist season in Maine and it can be hard to find accommodation. But there’s also a much higher chance of blue skies and warm days. Late May and late September are both wonderful times to visit. It’s worth spending time in the villages, towns, and cities on the coast of Maine. From quaint Boothbay Harbour to vibrant Camden, each one has its own unique charms. You can find a coastal map of Maine and more information about the state’s regions here. We love the Maine Windjammers! We have been on Ladona, Tabe, and Angelique. I haven’t been on Victory Chimes yet, but she docked right next to us the first year we sailed with them. Ah that’s so great, Dana! It was honestly one of the best experiences of my life, I’m hoping to go back this summer and sail with them again. All of the windjammers look so beautiful! I just finished Piece of the World a fictional book about Christina’s world. It is a perfect companion for this trip. I’ve wanted to go to Maine for sometime and I’m hoping this summer is finally the time! Liking forward to the food most if all! Ah, I’m hoping to go again this summer too! You definitely won’t be disappointed by the food 🙂 Hope you make it to Maine soon!